Great performance by Roger in this match, probaby one of the most dominant matches he's played in recent years. Due to the lengthy matches earlier in the day, and Wozniacki taking forever to push her way to a victory, Feds match didn't start till midnight New York time. Within 12 minutes, Roger was leading 5-0 in the first set. It was like watching tennis on fast forward. From the very first game, you just knew it would be one of those matches where Jesus Fed shows up and plays top drawer tennis. The serve was finding the spots, the backhand was an out and out weapon not a weakness and the forehand was finding the lines. The first set was a cake walk, the second was really more of the same, Monaco showed some resistance after Roger served 4 straight aces to lead 2-0. But at 4-2 he broke again and served out the set. The third ended up in a bagel beatdown for Monaco, which in the 4th round of a slam is pretty unheard of. There's really not much analysis to do, other than Fed played a great match, served well, kept his errors down, varied his play and hit plenty winners. Monaco didn't really play a bad game, he just doesn't have the weapons to hurt Roger in any shape or form, even on a really bad day it's likely Feds game would still get him through, and when he has a really good day like last night, we all know what happens – total destruction. I thought he fought bravely. Sometimes it's not your day. 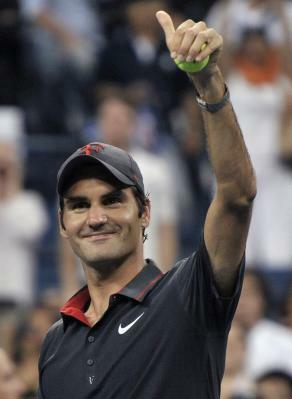 It was mine tonight,” Federer said on-court after the victory. “I'm very happy with the way I played. The match stats read pretty well. A good first serve %, and a good record at the net. And although this was a near peRFect performance, he will still need to up his level when he faces Tsonga in the Quarters, a rematch of his Wimbledon loss earlier this summer. Clearly this will be the toughest match of the tournament so far for Roger, but it will also be the toughest of Tsonga's too. You have to say that going into the match Tsonga has the edge – he's won the last 2 meetings between the pair at Wimbledon in the Quarters, and in Montreal last month. Tsonga is heading into the match after defeating Mardy Fish in 5 sets, which will definitely give him confidence, he was down 2 sets to 1. I didn't watch the match in full, so it's difficult to say how good he looked. He did convert a lot of break points though on the Fish serve, so Roger will definitely need to have a good serving day. But from what I saw, Fish played smart tennis to take that lead – he didn't go to toe to toe with Tsonga, it was sensible tennis, in a methodical and punctuated way really, getting to the net was a definite tactic. Clearly this play works. I think ultimately though Fish was playing too far behind the baseline in the end to pull through this match. That's not his style but in the 4th and 5th set he looked to be covering too much ground, which would have been a huge drain on energy and is the type of match Tsonga loves. It's exactly how he beat Nadal in 08 at the Australian Open. If he'd have kept up the aggression and not gotten hit off the court the outcome may have been different. That's definitely what Roger has to do, Tsonga thrives off rhythm, so mixing it up with spins and pace is clearly the way forward. The slice will be important as will making sure he ends many points at the net. Get Tsonga to make passing shots – he'll pull off some amazing shots, but over the course of a match, the % will always favour Roger as long as his approach shots have enough on them. Despite Tsongas form, I have to go with Roger here, it feels like just one of those matches that has to be, and I know if he doesn't win, I'll be mega disappointed. It's all setup for a revenge victory when it really matters, so I just hope he's learnt the lessons from the Wimbledon and Montreal defeats. Every time Roger meets Tsonga I just cast my mind back to the Australian Open in 2010, where Fed totally dismantled Tsongas game. If he plays at the level he did last night then it will be a similar story. As long as he doesn't slip into passive baseline mode trying to hit Tsonga off the court, then this will be a straight sets match. So I'm going for a 6-4 6-4 6-2 outcome. Djokovic maintained his great run by beating Dolgopolov in straight sets, Dolgo should have won the first set, and from there on in he didn't look like he believed he could win. He did show some weaknesses to the Djokovic game though which someone like Roger can exploit. Novak is pretty much a given semi finalist now, only fellow countryman Janko Tipsarevic awaits in the Quarters – he's never won a tour title nor featured in a grand slam semi so looks like a foregone conclusion to me. I just love to watch him play.